An acoustic guitar lesson on how to play "Foxglove" by Bruce Cockburn from his 1973 album, "Night Vision." It's a real classic finger picking instrumental. It's only 1:29 long but it's a very challenging piece and will prove difficult for even experienced finger pickers! There are two distinct techniques involved in playing this tune, and if you don't have those together, you'll be in for a lot of frustration! I go over both of those picking patterns in the tutorial. It's probably best to practice those for a while (maybe a long while, depending on where you're at with your skills) before you start getting into the notes. 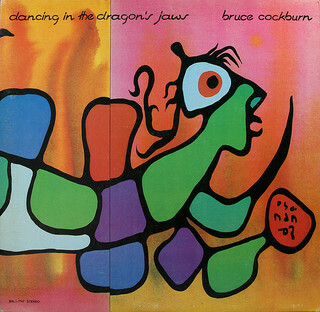 Bruce plays this at around 177BPM on the album which is really quick, but it's pretty well how he rolls when he's playing these upbeat joyous type tunes. On my demo, I was around 165BPM although I didn't play to a click. That's just where I felt most comfortable. You're better off playing a piece a bit slower and be accurate than to try to go too fast and make a muck of it, and that's pretty easy to do with this one! Keeping a steady meter is always a challenge in tunes like this so you'll have to really focus on being in time. PS The cover art above is a reproduction of an Alex Colville painting called "Horse and Train" (1954) Alex Coleville was a very talented Canadian painter. He passed away in 2013.